I have this necklace. It has a father, a mother and a little girl. I like it because they are all together. Family is really important. Recently, my dad, Corey Matthews, has taught my friends and me a very valuable lesson. A lesson that answers everyone’s question, What’s the secret to life? According to my dad, the secret to life is, “People change people.” Janitor Harley would probably be in jail if it wasn’t for my dad’s good influence on him. And Peaches would be in juvi for vandalism. Yesterday, Peaches (that’s Maya) came back. Yaaaaaaaaaaayyyyyyyy! But sadly, of course, my dad had to teach us about Mt. Vesuvius and how it destroyed the people who lived near it in Pompeii after being dormant for so many years. I had faith in Maya, but it’s my fault she went to the park and committed vandalism. But when she did vandalize, she wrote (or spray-painted) the word “Hope” on the old brick walls, as a message to those living in the run-down neighborhood. She claims that I stopped her from doing any real damage. This confuses me, because I wasn’t even there. How could I have stopped her from doing something I wasn’t even there for?? From Peaches’ perspective, two of her old friends were going after me and called her soft. She said she really believed she was going to do what they asked, but a part of her, which she calls “Dorothy”, wouldn’t let her. I guess people really do change people. It can be good. But the change can also be bad. Take my advice, sunshines. Learn from my mistakes. Become friends with the right people. By the right people, I mean people who will influence you for a better future. If you do, your Dorothy will keep you out of trouble. And if you don’t... well, just become friends with the right people. I must go now, Peaches is waiting for me by our bay window. So remember: “people change people.” Secret to life. And if you don't agree with that, well then, what is? I have been writing since before I could draw. I still can't draw. Girl Meets World inspires me a lot and I hope it inspires you too! The letters are lessons that the characters learn throughout the series. 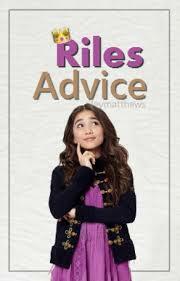 These lessons are taught by Cory Matthews and the letters are from the characters, such as Maya Hart, Riley Matthews, Farkle Minkus, and of course Lucas Friar! Thank you for reading my section! I hope you enjoy!